The Library's Research Engagement Team organised a series of public seminars during the International Love Data Week in February. This year's theme is Data in Everyday Life with two sub-themes of open data and data justice. Alison Knight: Can privacy still exist in an age of datafication? Data Trusts: What Are They There To Do, and What Should They Look Like? Kieron O'Hara, an associate professor in the WAIS group of ECS, will be considering data trusts' function, and arguing that a data trust should work within existing law to provide ethical, architectural and governance support for trustworthy data processing. For more information on this and other upcoming talks, see the WAIS Seminar series pages. 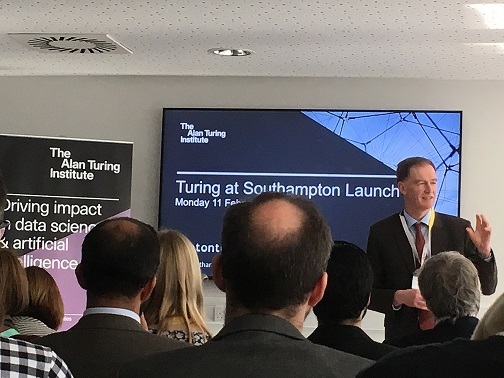 Turing @ Southampton will be officially launched at the start of Love Data week. The University of Southampton is a University Partner of The Alan Turing Institute, the UK's national institute for Data Science and Artificial Intelligence. The Web Science Institute acts as the main point of contact between the university and The Alan Turing Institute. The Institute’s goals are to undertake world-class research in data science and artificial intelligence, apply its research to real-world problems, drive economic impact and societal good, lead the training of a new generation of scientists, and shape the public conversation around data. The University of Southampton has pioneered theoretical and methodological advances in data science and data-centric engineering through a rich interdisciplinary network of research groups and in collaboration with a range of expert external partners. Southampton's work informs business, industrial and governmental decision-making, and helps illuminate fundamental questions in the physical, environmental, social and life sciences.